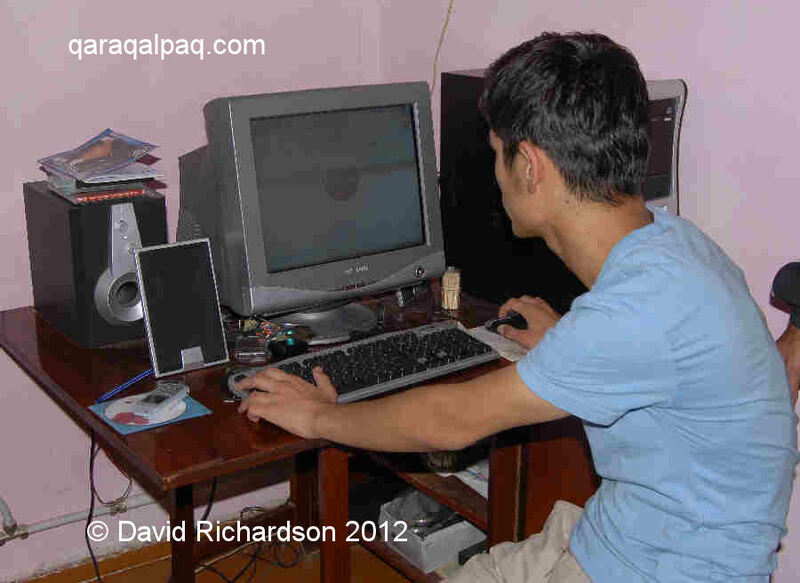 Time: Qaraqalpaqstan shares the same time zone as the rest of Uzbekistan, 5 hours ahead of UTC/GMT. There is no daylight saving time. In the winter it gets light by 0700 and dark by 1800. In the summer it is light by 0500 and does not get dark until 2000. Life goes on at a much slower pace than in the West. Tasks that might take minutes to be done in Europe seem to take ages in Qaraqalpaqstan. Professional people are generally punctual but if you make an arrangement with others they find it hard to understand why you are upset when they turn up two hours late. Weights and Measures: The metric system is used. Traders at the bazaars seem to only have 1kg weights for their scales and seem incapable of giving you a price for just a couple of tomatoes. So it's generally 1kg or nothing! Water: It is not advisable to drink the local tap water. Stick to bottled water, which is in plentiful supply either still or carbonated. The Qaraqalpaq word for water is suw and carbonated water is gazlı suw. Major and local brands of fizzy soft drinks are also easy to buy. Electricity: The supply is 220 volt, 50 hertz and you need a continental-style twin round plug. We have experienced several power cuts during our visits. It is advisable to take a torch when walking at night as the street lighting is not very good and manhole covers are often missing – an effective trap for an unwary tourist! Toilets Never employ a Qaraqalpaq plumber! Toilets, washbasins, and showers are generally primitive by Western standards. The homes of the better-off normally have Western-style toilets. In rural areas and even in a large number of places in No'kis, pit loos are the norm. We advise women to pack some toilet paper in their bag when they go out for the day. Showers are much more common than baths. Bath water often looks grimy, either because of inadequate purification or because of rust contamination from old iron pipes. Most Western brands of toiletries are available on the Central Bazaaar. 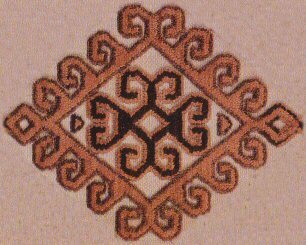 Currency: Although Qaraqalpaqstan is in theory an Autonomous Republic it still uses the Uzbek so'm. This is principally available in the form of notes in denominations of 100, 200, 500, and 1,000. Locals can count a wad of so'm at an amazing speed. See our section on Money & Banks for more information. The best times to visit are Spring and Autumn. The weather in March can still be cold and overcast. March and April are the wettest months. It is warmer and sunnier in late April and May. If you want to see the yurts up then you do need to wait until at least late May or early June. The heat can become exhausting in late June. Air conditioning is a luxury for most Qaraqalpaqs that only the wealthy can afford and even fans are not common. Without them it is very hard to sleep in the summer. September and October are also very pleasant months to visit but you may need a jumper in the evenings. To find out more about the weather in No'kis click here. No vaccinations are required for tourists travelling to Qaraqalpaqstan. Mosquitoes can be a problem, especially by tree-lined canals, so bring repellent with you. They can also be a pest in certain parts of No'kis, making it difficult to sit outside in the summer evenings. In rural areas people put netting around their yurt walls to keep out the mosquitoes. You do not need malaria prophylaxis. Remember that the sun is fierce in summer and wherever you go in Qaraqalpaqstan there is little shade cover. Take a sun hat and sunglasses. It is a very dry heat and you can feel as if all of the moisture is being sucked out of you, so drink plenty of fluids. It is difficult to buy rehydration solution in Qaraqalpaqstan so as an alternative try soft drinks that have been allowed to go flat . The main problems you are likely to face are traveller's tummy and a sore throat. There are several chemist shops by the bazaar where you can buy sore throat remedies and can sometimes get charcoal tablets. 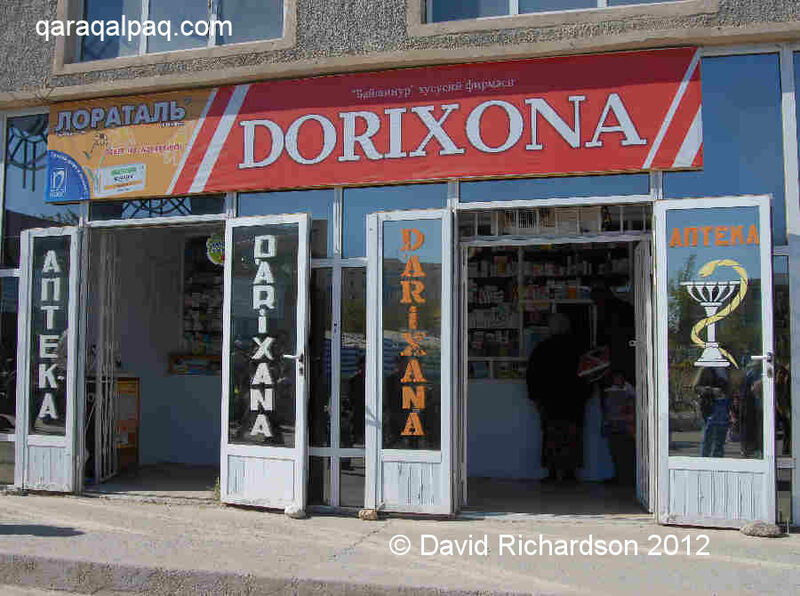 A pharmacy is a da'rixana in Qaraqalpaq or an apteke in Russian. Qaraqalpaqstan remains a conservative country and visitors should therefore dress appropriately. Although we have noticed an increasing number of young women wearing tight jeans and short-sleeved tops in No'kis in recent years, this is far from the case out in the delta. We would advise both men and women against wearing shorts or sleeveless tops if they want to be treated respectfully by local people, especially in rural areas. Only children wear sleeveless tops and short trousers. Trousers and a loose-sleeved top are a safe bet for women, especially as sleeves provide some protection from the sun. Sue often wears long cotton trousers and a long, light Indian cotton kameez. There is no need to cover your hair unless entering a holy place. However we would recommend taking a scarf when visiting Moynaq as it can be very dusty and windy and your hair quickly becomes full of sand. Walking boots are recommended out of town. In rural areas people dress very conservatively, whether grandmothers or young women. One of the great things about Qaraqalpaqstan is that the less desirable effects of tourism have yet to reach here. You are very unlikely to be pursued by children asking for pens and sweets as you are in Bukhara. We would really like it to stay that way and would implore you not to encourage such behaviour by refraining from giving out these things. The standard way to greet someone is to firmly shake hands with your right hand while placing your left hand over your heart and saying assalum a'leykum, peace be with you. The majority of people are very hospitable and as a visitor will welcome you into their homes and offer you tea and snacks. If you stay longer they will insist on sharing whatever food they have with you. If you are lucky enough to be invited into someone's home (whether it be a house or a yurt) you should remove your shoes before entering. This also applies to visiting a mosque or sitting on a shayxana bed. Your hostess will generally produce a pitcher of water for you to wash your hands and a towel to dry them on. From a Western perspective the reception room in a Qaraqalpaq home seems to be bereft of furniture. The main item will generally be a large cupboard displaying the china and family portraits. Often a large Russian-style boiler is used for heating. In most homes seating is on bedrolls on the floor around a long low table. Cushions will be provided for you to rest against. 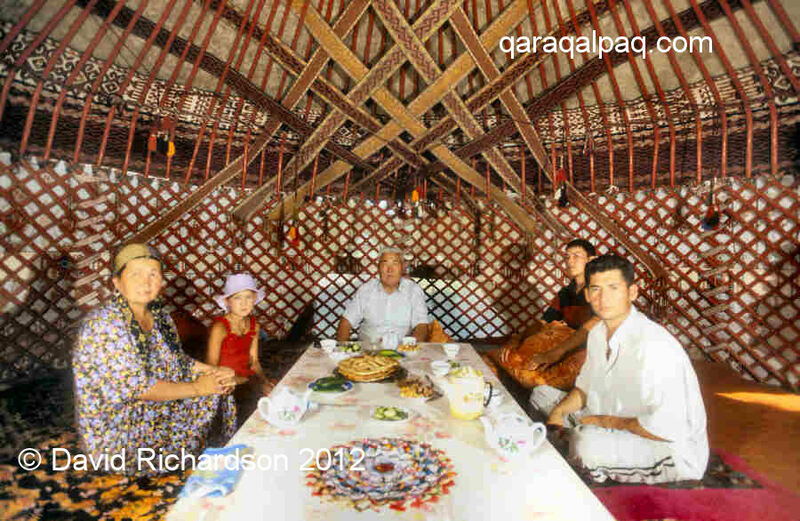 Taking tea with a Qaraqalpaq family at Erkindarya. The males are sitting on the female side and the females on the male side! You will inevitably be offered snacks and it is only polite to try some even if you have just eaten. Remember to always pass things only with your right hand. At the end of a meal or when passing a holy place such as a cemetery the fatiha is generally performed as a sign of thanks and blessing. This is the gesture of holding out cupped palms to receive God's blessings and then passing them over your face. It is a good idea to have some photos of your city and your family to show your hosts. If you need to take a gift the kiosks by the NEO restaurant have a good selection of chocolates and there are also several florists on this corner. As you leave a round of nan bread will be produced by the lady of the house. This is a sign of the family's hospitality. It is customary to tear off a small piece and eat it. Bread has an almost holy status among the Qaraqalpaqs and must be treated with respect. Never place bread upside down on a table or place it directly on the ground. Qaraqalpaqstan is a pretty safe place for tourists. There is very little crime. You do need to be wary of pickpockets at the busy bazaars, but no more so than you would in most countries. Having said this one of our friends was mugged in No'kis and spent time in a local hospital recovering, so the normal cautions to every traveller apply. Don't leave valuables laying around in your hotel room. Your room maid earns less than $20 a month, so don't place temptations in front of her. Sue has even had items stolen from her dirty laundry bag - the thief guessed they would not be missed until some time later. 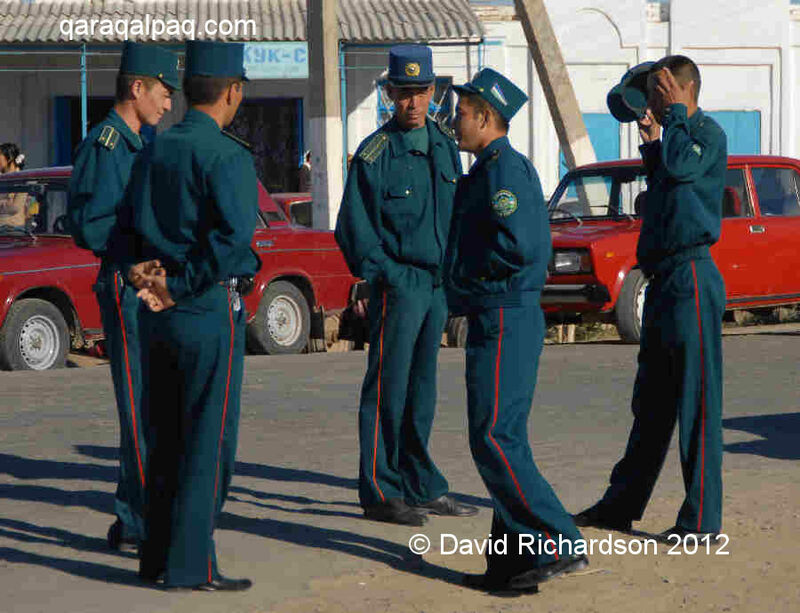 It sometimes seems as though almost half the male population of Qaraqalpaqstan is in police uniform. However No'kis is nothing like Tashkent where there seems to be a policeman on every corner. The ordinary civilian police force are known as the militsia (derived from the Soviet peoples's militia). Yet not everyone wearing the green uniform belongs to the militsia. They could belong to customs, immigration, transport, traffic control, various branches of the Ministry of Internal Affairs, and so on. The only way to distinguish between them is to be able to recognize the subtle differences between their arm badges. However if you are a foreigner who has not committed any crime they are unlikely to cause you any problems. The Uzbek police have the right to check your documentaion and we always carry a scanned copy of our passports in colour wherever we go just in case, leaving the originals in a secure place. However we have only been asked to show our passports on rare occasions and only then at road checkpoints. Our drivers however have been far more frequently checked. The police do not have the right to examine your money or your belongings, unless you have been arrested for an offence, in which case you should contact your local embassy or consulate immediately (to which you have the right under the Vienna Convention on Consular Relations). Don't forget that Qaraqalpaqstan is one of the main drug smuggling routes between Afghanistan and Russia. If you come here with drugs you are an idiot. The penalties for the possession, use, or trafficking of illegal drugs are severe and convicted offenders can expect long jail sentences and heavy fines. 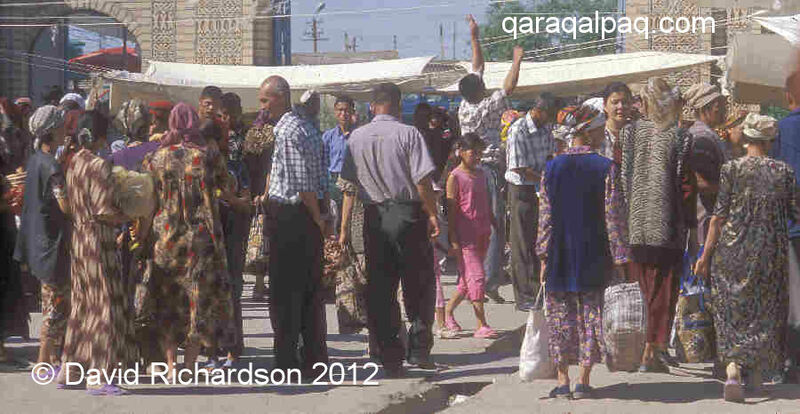 Like the rest of Uzbekistan, Qaraqalpaqstan is rife with bribery and corruption. Furthermore the Uzbek militia are some of the worst culprits. However they only prey on the local population so most tourists are completely unaware of this. Should you be asked for a bribe by an official, simply refuse and mention that such behaviour is illegal. If it turns out that a bribe is the best way to solve a particular local problem that you have encountered, make sure that it is handled by a local who knows the system. The main annoyance you are likely to encounter is from officialdom. God knows we have enough bureaucrats and faceless officials in the West, but the problem in Qaraqalpaqstan is made worse by the fact that there is no delegation of authority and things move at a slow pace. So if you require some permission or authority be polite and patient. The most common encounter with officialdom arises from the need to register with OVIR if you have arranged a homestay. Some tourists "forget" to register without problems but this is not generally recommended. See our section on OVIR on the Accommodation page. If you do have problems with any officials make sure you take their name and ask to see their superior. If it's appropriate, take a discreet photograph of them. Difficulties often melt away if they realize you are not going to be intimidated by them. Always remain calm and polite and avoid a confrontational approach as this may well lead to a competition to see who is the most macho! Central Asia is a great place for photography. In Qaraqalpaqstan the main problems arise from dust and lighting. The northern delta, Moynaq, the Aral region, and the qalas are all very dusty places and in the days when we took slides, scratches were always a major problem. If you have a compact digital camera it should be sealed against dust but be careful when you change lenses with an SLR. Our biggest lighting problems arise in the desert or when photographing some of the remote archaeological sites. In the day time the light can be so intense that you get a "white-out" effect, which causes your automatic exposure to go haywire. To make matters worse it is impossible to see the screen on your camera to check your shots. If you are serious, take a black cloth to cover your head and the camera so that you can see what you have been shooting. Our best advice is to bracket widely. Most Qaraqalpaqs are delighted to be photographed, but you will get the best shots if you ask people's permission beforehand. Put down the camera and interact with people first - they might be poverty-stricken and have had a hard life, but they're human beings with dignity just like you. Ask them what they are up to, where they are going, how long they have lived in this place? Soon you will be chatting and drinking tea together, finding out about local life. Then ask to take your formal group photographs and once people have relaxed, shoot a few candids. Photography near airports, military barracks, road checkpoints, the Joqargı Ken'es, and police stations can cause problems. Uzbekistan Airways frequently announce that photography is forbidden on internal flights but nobody knows why. People are insecure so it is always easier for officials to say no. To date there are no postcards for sale in Qaraqalpaqstan and therefore you are unlikely to need to use the Post Office other than to make a telephone call. The Central Post Office is on the corner of Qaraqalpaqstan and Patrice Lumumba ko'shesi. It opens Monday to Friday and stays open until the early evening. When writing a letter to Qaraqalpaqstan or Uzbekistan, addresses are written in reverse order: post/zip code, city, street name, house number, apartment number, and the name of the person. When writing from Qaraqalpaqstan, write the address normally but repeat the country of destination on the first line of the address. Letters can take from two weeks up to over a month to reach Europe of the USA. Internet access is available at the Jipek Joli hotel at a cost of $2 per hour. There are also several internet cafés in town but they are often full of children playing games and you may have a long wait. One that we have found to be reliable is on G'a'rezsizlik. With the NEO restaurant on your left walk to the kiosks on the corner and turn left. Walk past the shashlık stalls to the next block and the internet café is in a back room. It costs 500 so'm per hour. 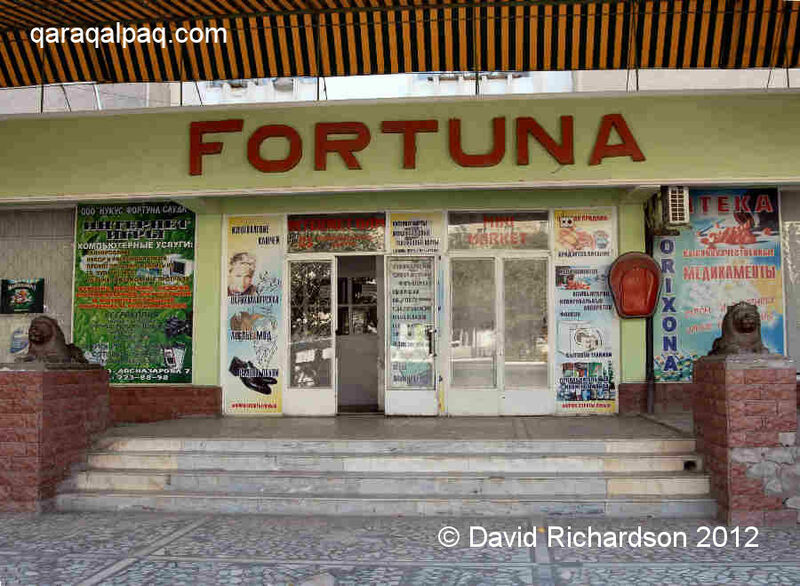 Another is on Dosnazarov, next to the Kafe Juran, but again it is often busy with kids playing games. Outside the internet café on Dosnazarov. 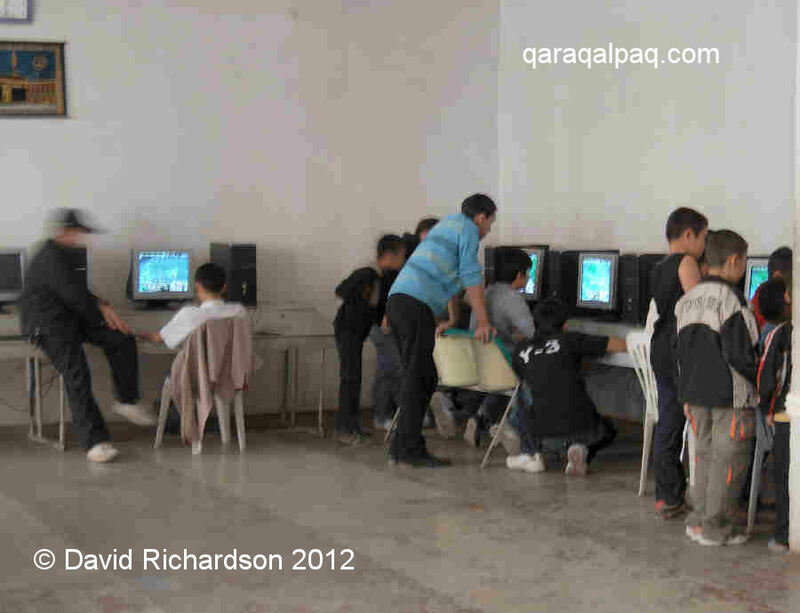 Finally there is an internet café on Doslıq Guzari in the building to the north of the amphitheatre. The sign on the building is for Qaraqalpaq Photography. Many internet sites such as those of the BBC and CNN are blocked, although it is often possible to obtain news by looking at the website of some international newspapers. The emergency dialling code is 03. 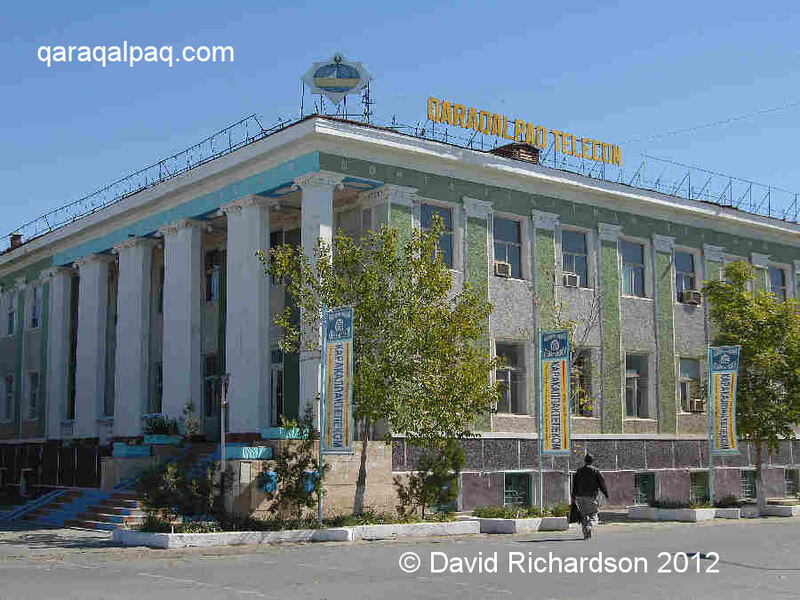 Qaraqalpaqstan is served by a fairly ancient land-line telephone system. It is possible to make an international call from the Central Post Office by stating the number you require and then going into a booth to take the call. You pay afterwards. Organizations in Qaraqalpaqstan are usually strapped for cash, so if you can't reach a number it's probably because they have been cut off for not paying the bill. The urban centres of Qaraqalpaqstan have fairly good GSM cellphone coverage, but the signal soon fades as you head north into the delta. The first domestic mobile phone company was Uzdunrobita (code 97), a US joint-venture established in 1991 with the Uzbek Ministry of Communications. It was subsequently acquired from President Karimov's daughter Gulnara Karimova by the leading Russian mobile company Mobile TeleSystems or MTS and is now confusingly called MTC. You will see their red logos everywhere. They control 50% of the Uzbek market. Today it has several competitors, the main one being Unitel, which was established by Daewoo. Other smaller networks include Uzbektelecom, Coscom, Perfectum Mobile, and Buztel. Roaming charges are expensive and we recommend that you purchase a local SIM-card on the bazaar if you are staying for a while. To make an international call from Qaraqalpaqstan the outgoing code is 8-10 followed by the relevant country code (for example 8-10 44 for the UK). Books There are two publishing houses in No'kis - "Qaraqalpaqstan" and "Bilim". They publish small low-quality books on history and local culture in the Qaraqalpaq language. There is currently only one bookshop in No'kis selling materials for local schools and colleges. Second-hand books, mainly Russian and Qaraqalpaq, are sold on the Central Bazaar and at the No'kis Sunday flea market. The best selection of English language books will be found at the Savitsky Museum shop and kiosk, along with a few second-hand books relating to local history, oral epics, and ethnography. In 2001 the insecure Uzbek authorities conducted a purge of the nations libraries, removing all "ideologically incorrect" books. 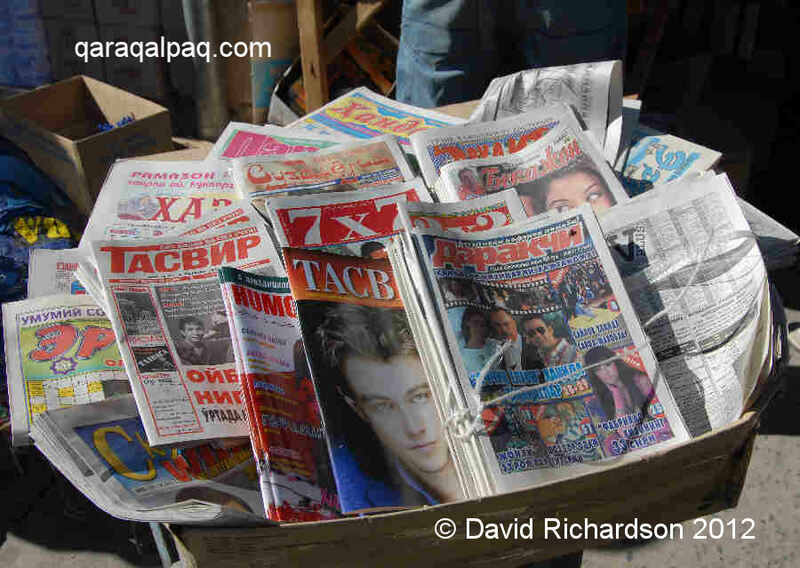 There are no foreign newspapers in Qaraqalpaqstan and even local newspapers are hard to find - they only seem to be for sale on the bazaar. 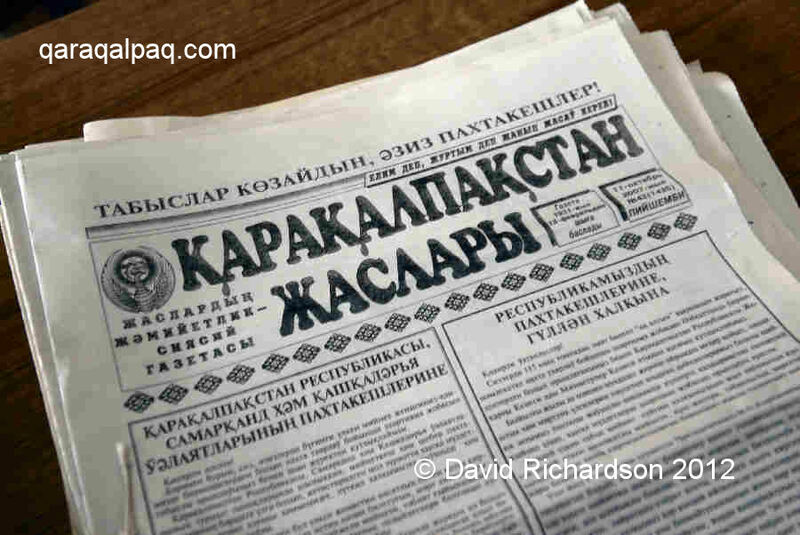 There are four local newspapers - Vestnik Karakalpakstan (in Russian) and Erkin Qaraqalpaqstan (in Qaraqalpaq), both published 2 or 3 times a week, and Qaraqalpaqstan Jasları and Ma'deniyat ha'm Sport, both in Qaraqalpaq and both published weekly. There are two Uzbek newspapers published in Tashkent - Pravda Vostoka (Truth of the East) and Narodnoe Slova (People's Word), each published 2 or 3 times a week. There is also Novosti Uzbekistan from Tashkent and the popular Uzbek rag, Darakchy. According to the local media expert Olga Borisova, the papers with the highest circulation are Amu Tongi, Qaraqalpaqstan Jasları, and Erkin Qaraqalpaqstan. Vestnik Karakalpakstan is apparently no longer so popular. In addition there are many newspaper-like publications with puzzles etc. There is also a new publication called Jipek Joli, run by young people, which has more emphasis on entertainment. A selection of popular papers on sale in No'kis bazaar. Newspapers consist of just four or six pages of dull uninteresting material, mainly promoting the successes and achievements of both the national and local governments with announcements on visits by leading politicians, the cotton harvest, or the opening of new factories or colleges. They lack any analysis or commentary on events and have no coverage of international news. It is not surprising that most local people switch off. There are two local TV stations, Qaraqalpaq TV broadcast by the State Television and Radio company from No'kis, and Xorazm TV broadcast by the Television and Radio company of the Khorezm viloyati in Urgench. The latter can only be received in southern Qaraqalpaqstan. According to Olga Borisova, Qaraqalpaq TV broadcasts for just 5 hours per day, 2½ hours of which are cartoons and films. The production quality is very low. The same news programme is repeated several times a week. A lot of time is devoted to coverage of the cotton harvest. From our own experience, Qaraqalpaq TV is not particularly popular. 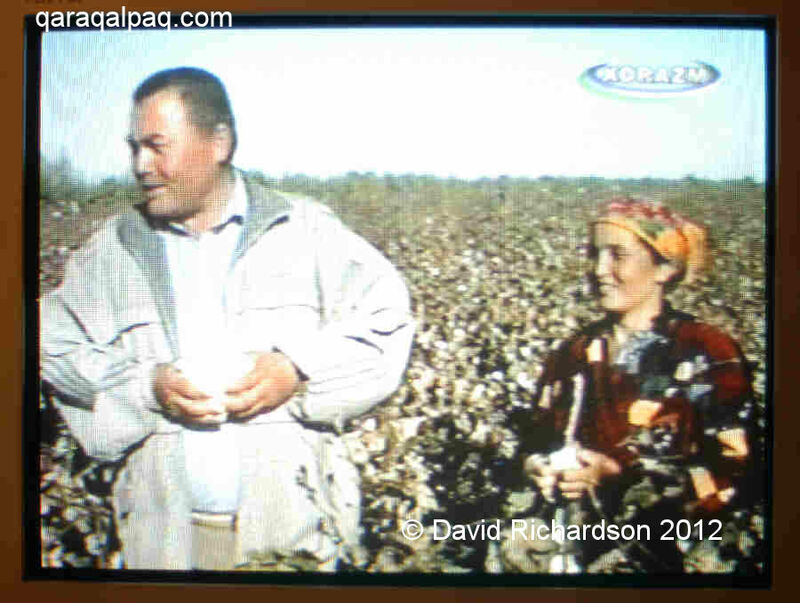 Cotton pickers on Xorazm TV. Many people have satellite dishes and tend to prefer the TV channels broadcast from Moscow as they have more variety in their programming with soaps, quiz shows, and coverage of international news events. TV channels are also received from Tashkent, Almaty, and Ashgabat. To see a sample of the "Uzbekistan" channel broadcast from Tashkent click here. The favourite station of one of our close friends in No'kis is the Fashion Channel! 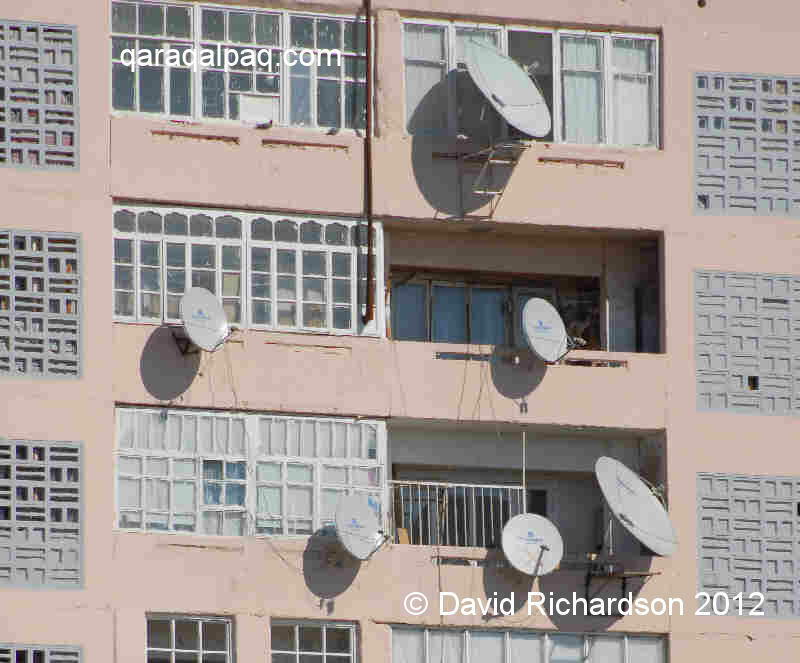 Satellite dishes on a No'kis apartment block. Local radio is broadcast from No'kis. International radio channels such as the BBC World Service can be jammed. Many middle-class homes now have internet access using dial-up connections. Service is slow and sometimes not available. PC computer with internet connection in a private No'kis home. We have found it impossible to obtain international news information through leading Western news websites such as www.bbc.com. However it is possible to connect to Western newspaper sites. The website of the official Uzbekistan National News Agency can be found here. No'kis has a very limited entertainment industry. 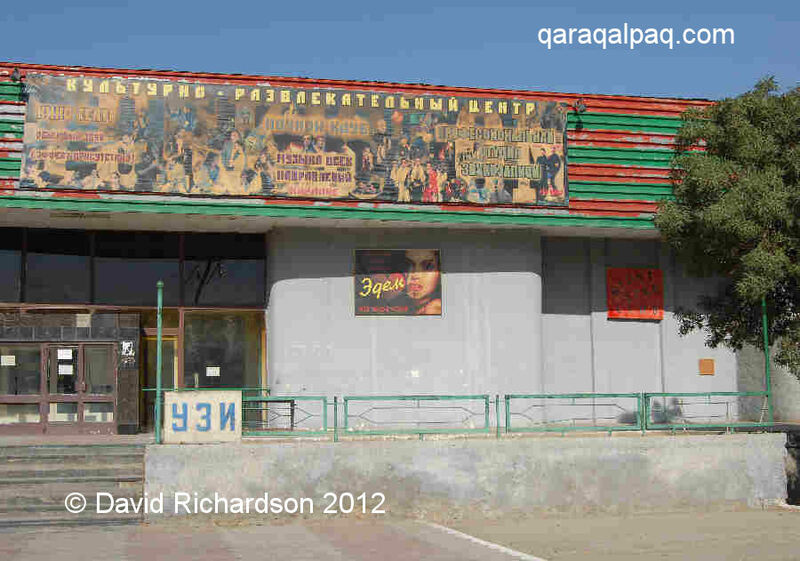 In the Soviet era the Berdax Theatre was a thriving institution with performances of Qaraqalpaq folk epics and Shakespeare's Othello. Today performances are only staged periodically. The Children's Theatre named after Sapar Xojeniyazov is at 46 Sharif Rashidov ko'shesi and there is a small Puppet Theatre at House 27, Microdistrict 22. 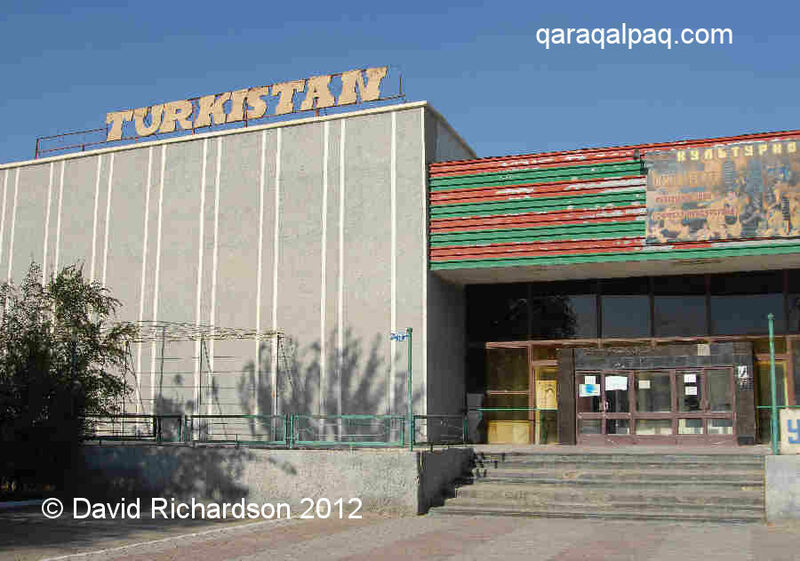 There are a couple of local cinemas, the "Amu Darya" on Ernazar Alako'z ko'shesi and the "Turkestan" on Doznazarov. Sign above the entrance to the Cinema and Night Star Club. The latter also styles itself as a "Cultural-Entertainment Centre", with a professional sound recording studio, kino teatr, beauty salon, and the Night Star Club nightclub with three-dimensional sound. We are too old to have tried it out ourselves but would be interested in feedback from younger visitors.